Jim Flood, a chemist by profession, is a member of Amateur Astronomers, Inc. His project is the LAST of 13 amateur projects to be scheduled on the Hubble Space Telescope. His research is the Morphology of the active nucleus and radial filaments of NGC 1808, using the WFPC2 instrument. 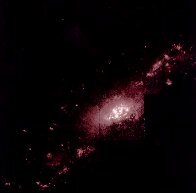 His observations of NGC 1808 were made on August 14, 1997. 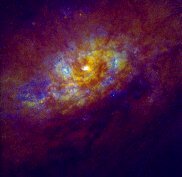 Abstract: A high resolution examination of the galactic core of NGC 1808 can resolve questions as to the nature of it's energetic core "hot spots" variously attributed to unusual circumnuclear starburst activity, massive supernova remnants or black hole accretion disk models. Also present are pronounced radial dust filaments streaming from the core of NGC 1808 in association with large gaseous polar outflows, suggestive of galactic fountaining. In January Jim dropped by AAI's Sperry Observatory, back from a meeting of the American Astronomical Society, where he had had some of his results on display. I asked him if he would mind having the images scanned for the UACNJ site. No problem. Following are four small versions of the images Jim got from the Hubble of NGC 1808. (Click on the small images if you want to view larger ones.) 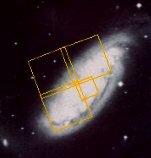 Compare the Palomar survey image to the detail of those from the Hubble. Note that you will not find these images elsewhere on the internet. 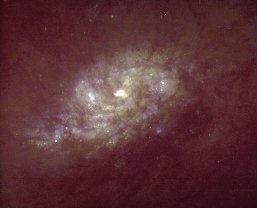 The peculiar barred spiral galaxy NGC 1808 as it appears in the Digitized (Palomar) Sky Survey, with the WFPC2 field-of-view overlayed. The galaxy is about 40 million light years away in the southern constellation of Columba. The outer arms of the galaxy are warped with respect to the prominent inner dust lanes. This is evidence that NGC 1808 may have had a tidal interaction with the nearby galaxy NGC 1792, which may have triggered the circumnuclear starburst activity seen in the Hubble images. Mosaicked broad band R image of NGC 1808. Multiple star clusters are visible amid dense gas and dust. Filaments of dust can be seen streaming from the starburst region along the minor axis of the galaxy and into the galactic halo. The portion of the galaxy seen here is about 35,000 light years across. 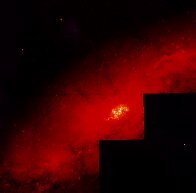 Narrow band [NII - Singly ionized Nitrogen] emission image of NGC 1808. Notice the star formation triggered in the galactic bar, as matter streams toward the nucleus to feed the starburst. High-resolution view (just the PC1 camera) of the starburst activity in the circumnuclear region. Many compact star clusters are revealed, but many more are probably obscured by the thick spiralling lanes of gas and dust. The brightest knot of star formation seen here is probably a giant cluster of stars at the very center of the galaxy. The starburst region shown here is about 3,000 light years across. False color image of the high-resolution view above showing enhanced details.